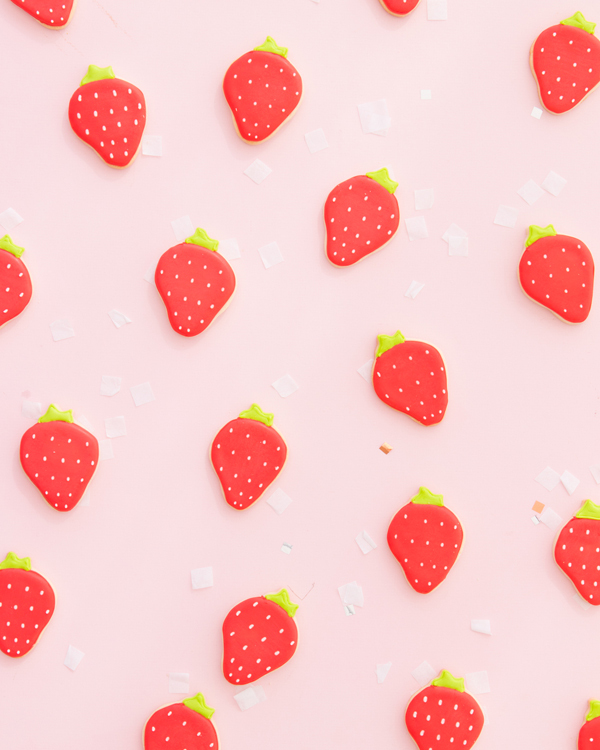 It’s the most magical time of the year…when I come home with giant flats of strawberries and we gorge ourselves on their sweetness. 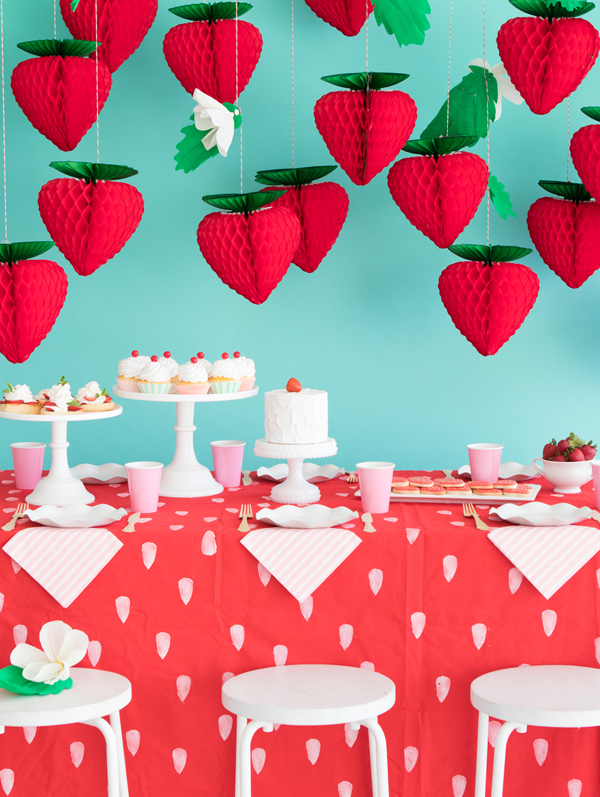 I love the idea of a strawberry birthday party theme. 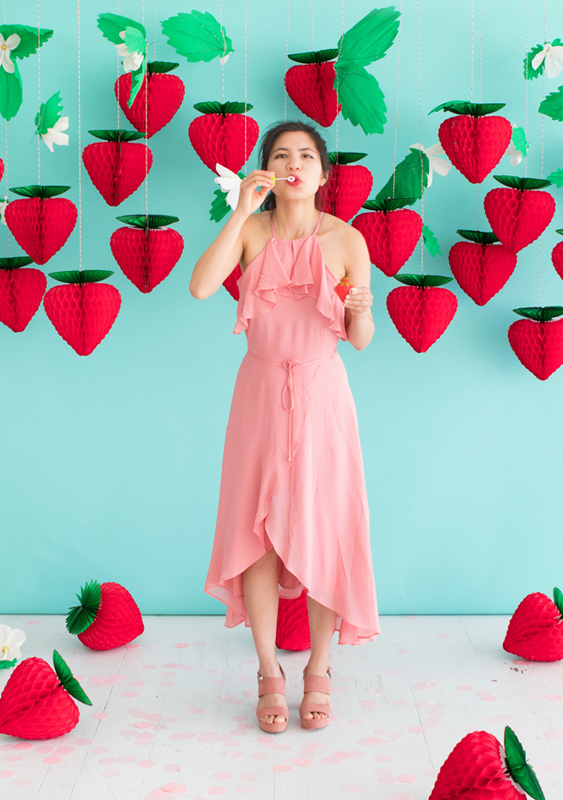 Perfect for the person who loves strawberries. 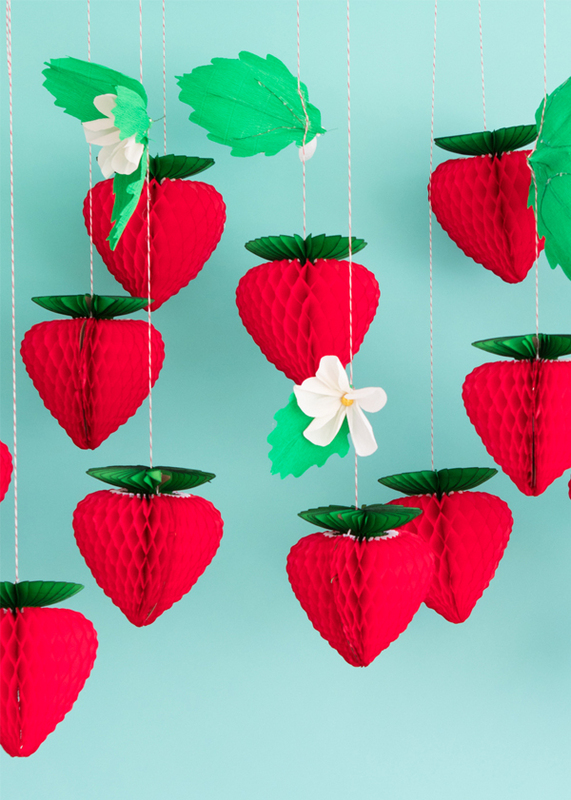 For decor we hung a bunch of honeycomb strawberries (so easy!) and we made some homemade strawberry blossoms to hang with them. 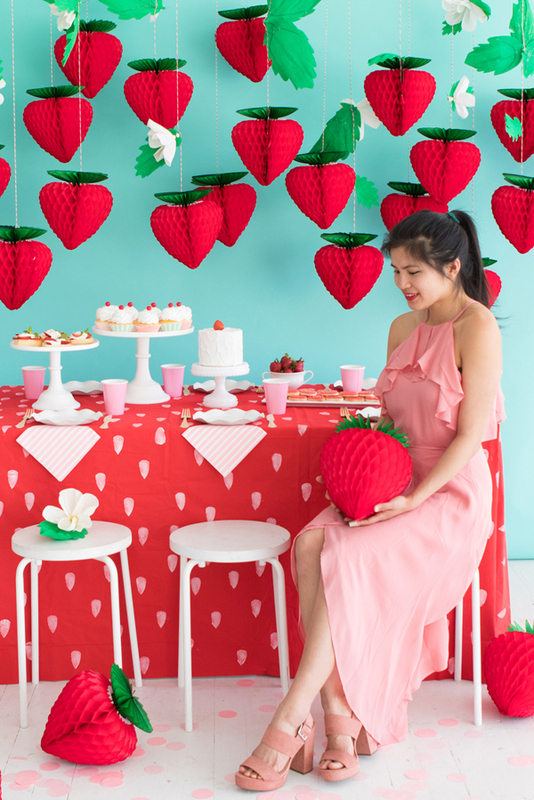 We also made a strawberry tablecloth with our favorite paper tablecloths. All you do is stamp the tablecloth with a potato stamp. 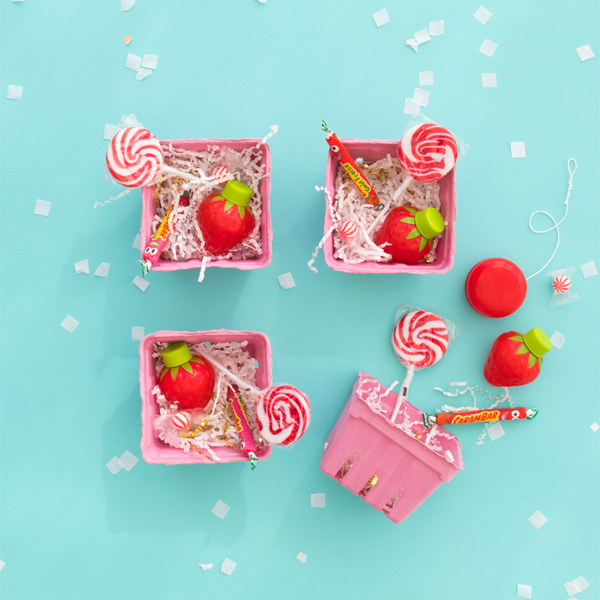 For food we served strawberry short cake and cookies as treats and I think my favorite detail might be these sweet little pink strawberry baskets as favors (filled with these strawberry bubbles obviously!) It’s safe to say I like this party berry much. Step 1: Make a seed-like shape on cardstock to use as a template. Step 2: Cut your potato in half. Then, place the cardstock template on the face of the potato. Step 3: Using a knife, whittle away the negative space around your template, leaving only the raised shape of your design. Step 4: Apply a light, even layer of paint to the stamp with a paintbrush. Step 5: Gently press your stamp on the tablecloth, repeating until the tablecloth is filled! Step 1: Cut 5 petal shapes out of white crepe paper. Ours were roughly 4.5 inches long and 3.5 inches wide at the widest point. Lightly stretch the crepe paper to achieve the curvature of a petal. Step 2: Cut a 6 inch piece of floral paddle wire. Fold each petal inward and gather the bottom part of the petals in a bunch. Secure the bunch by wrapping floral wire around it a few times, leaving a 3 inch tail. Open up and pull the petals backward to create a flower shape. Step 3: Cut a small rectangle out of gold crepe paper. Crumple up a piece of scrap crepe paper and wrap the gold crepe paper around it to make a ball. Hot glue the ball to the center of the flower. 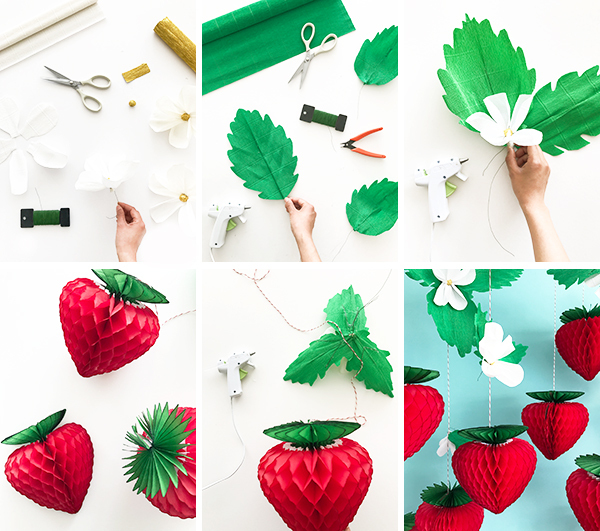 Step 4: Look up an image of strawberry flowers and leaves. Cut out a bunch of leaf shapes out of crepe paper that are about 5-10 inches long. Step 5: Cut a piece of floral paddle wire that is the length of the leaf. Fold the leaf in half vertically to create a center line. Apply a thin line of hot glue down the bottom half of the center line to attach the floral wire, leaving a three inch stem. Fold the leaf in half so the wire is no longer visible. Add a bit more hot glue if needed. If the leaf needs more support, cut a piece of floral wire, bend it into a wide v-shape, and hot glue it to the back of the leaf. Step 6: Attach 1-3 leaves to a flower with hot glue. Twist the floral wire stems together. Step 7: Cut a long piece of twine. Use a piece of washi tape to attach the twine as close to the tip of the strawberry honeycomb as possible. Assemble the honeycomb. Step 8: To make strawberry vines, first determine where you want to attach the leaves on the strand of twine from Step 7. Hot glue the twine to the back of the leaf cluster so it lies vertically. Trim any excess wire. Step 9: Repeat Steps 7 and 8 with the rest of the honeycombs. 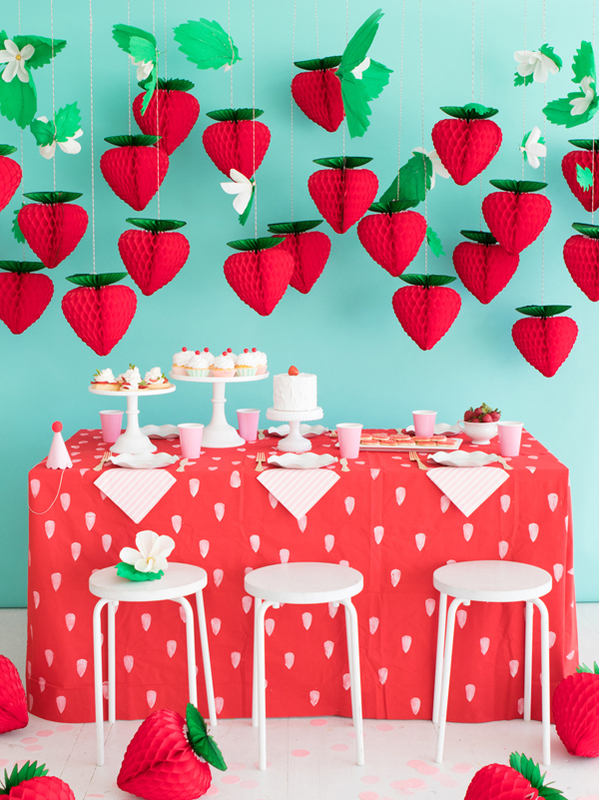 Step 10: Tape your strawberry vines to the ceiling to hang, staggering the lengths. It’s party time! Wow! This is so fun! What a great idea… and I love that table cloth! This is so darling! I need this in my life! 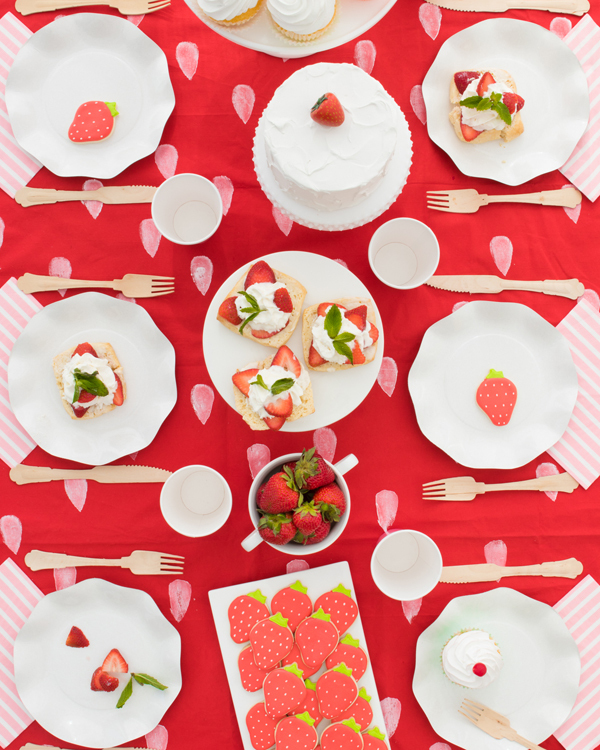 This would be my party, I absolutely love strawberries! So cool!